Appearance: mixed leaf colors from russets, to greens to silver. Consistent, well-shaped, light whole leaf. Flavor: bright, pre-1st Flush leaf with just a little of the modern European ‘green’ flavor profile. Its flavor is delicate and sweet, yet subtle on the palate, with a lightly floral warmth and hints of soft stone fruit. This tea was harvested at the earliest point of the plucking season in Darjeeling and it is a special, limited production early spring tea. One might look at this tea as a pre-1st flush tea. 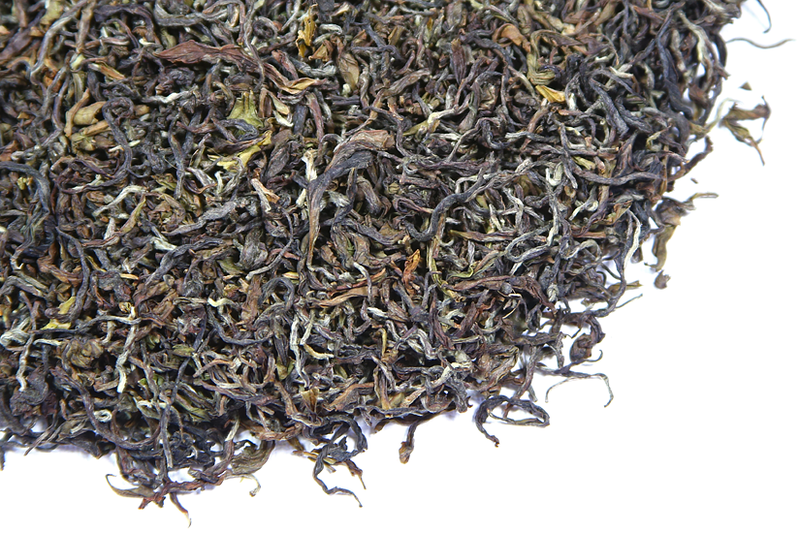 Teas in this category do not meet standard sieve sizes for the leaf, so they are not graded with the customary designations used for Darjeeling 1st Flush teas but are given distinguishing names such as ‘Moonshine’ or ‘Peach Blossom’ which represent their unique taste characteristics or are simply fanciful. They are also sold in specific, small lots, in this case EX-11, and are often sold to the same tea specialists every year. This year, Tea Trekker’s Moonshine EX- 11 Darjeeling tea was plucked on the 12th of March (a few days earlier than the 2018 harvest began). It is an early season specialty tea with a limited production of roughly 10-15 kilos per day for only a few days. These early season teas (actually pre-1st flush) require the skill of the most experienced tea pickers and are the most expressive examples of the terroir of any tea garden. Every plucking session, the pickers must explore each nook and cranny of the garden in order to find the leaf that has emerged from the recently-dormant tea bush, picking only the most perfect emerging buds and leaves. When the weather is finicky, (as it has been) it can be quite a challenge to keep up with the unpredictable emergence of new leaf. The aroma is lightly flowery (similar to the 2016 & 2018 harvest seasons, but more focused than either of those harvests) breezy with hints of fresh grass and green herbs. Its flavor is concentrated and its mouth feel honey-rich, yet subtle on the palate, with a lightly floral warmth and hints of ripe stone fruit in aroma. Our 2019 Moonshine tea is from a section of the tea garden that still maintains old China tea bush varietals. The yields from this section are low but the tea has excellent flavor. The local weather conditions bring out the best flavor from these tea bushes in the spring, especially this year, as 2019 has started out with ample rainfall and the temperatures rising quickly, which encourages rapid emergence of the buds. “EX” lots of tea are difficult to obtain in today’s competitive global tea market, so we are quite pleased to have this tea again for 2019! The Glenburn Tea Estate is located in the Glenburn Valley at an altitude of approximately 3,200 feet. The journey is about 3 hours from the Bagdogra airport. The journey to the estate follows the course of the River Teesta ( take a left at the bridge or you will arrive in Sikkim) before the climb up towards Darjeeling, and then the drive down into the Glenburn valley.